Nocs NS2 v2 review | What Hi-Fi? Nocs made a name for itself with its headphones range, before moving into the blossoming powered speaker market last year. First there was the NS2 Airplay desktop speaker, which restricted wireless streaming to Apple users only, and now the Swedish manufacturer has brought an Apple and Android-friendly version to the market: the NS2 v2 (or ‘version 2’). With the NS2’s Airplay support and 3.5mm input still on-board, the well-featured NS2 v2 also has Bluetooth and Spotify Connect – handy for subscribers to Spotify Premium. The ‘v2’ also adds a green finish to the original NS2’s already colourful line-up of yellow, white, orange, black, red or grey. We thought our favourite Award-winning Ruark MR1s were diminutive, but the Nocs really are dinky – perfect for, say, setting at the side of a computer or on a kitchen worktop. Unlike the Ruark’s traditional speaker fascia, the NS2 v2’s design is firmly in the new age: the MDF cabinets’ rubber coating makes for a super-smooth and clean matte-finish, while its curvaceous corners are nice. The rounded edges around the 7cm Kevlar drivers and 20mm silk dome tweeters (which are driven by Class D amplifiers) are appealing, too, as are the contrasting, distinctive black-woven Kevlar drivers. Solidly built and nice to look at, the NS2 comes with a worktop-friendly strip of foam on the bottom of the cabinet. The lack of speaker grilles makes for a hole-free façade, while a front-facing single-slot port allows for flexible positioning. 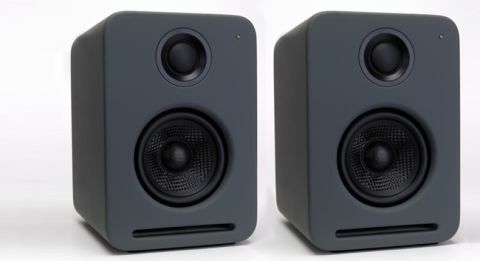 The right-hand side speaker is the ‘chief unit’: receiving the mains power and has source, power and set-up buttons, while a lead – there’s 1.25m and 3m cables in the box – feeds into the left-hand speaker to connect the two. Set up is simple. Holding the ‘set-up’ button on the right-hand speaker pairs your device over Bluetooth. To connect it to your network, simply download the Nocs NS2 app (free, iOS and Android) and follow the steps. Apple devices can also be set-up via the service-only USB port. One look at the Nocs and it’d be easy to assume performance would be limited due to its size. But don’t be fooled – the Nocs’ presentation is big, detailed and full of punch and panache. David Bowie’s (You Will) Set the World on Fire is one of the more energetic songs on his The Next Day album, but the Nocs have the rhythmic aptitude and enough fire in their belly to drive it along. Their presentation is reasonably clear over Bluetooth and Airplay – though even more so over a wired connection – and as direct and forthright as they come. Unfussy, too, they perform well out in the open or against a rear wall. If you’ve got some MP3 files in your music library, you’re in luck: even a low-res file of The Naked and Famous’s dense, anarchic Punching In A Dream pours out from the Nocs with reasonable clarity and insight. Slow things down with Daft Punk’s Within and there’s fluidity and variation to the piano sequence. Treble sparkles as cymbals simmer in the background, and bass goes deeper than you expect for little speakers. The NS2 v2’s aren’t the last word in balance, however, or subtlety for that matter. There’s a hint of hardness in the midrange, and small details are often lost, but we can get past these. Sometimes good things come in small packages – and that’s true of the Nocs NS2 v2s. They might not be as transparent or dynamically expressive as the class-leaders at this price, but they’re bags of fun, can connect to almost any device, and will sit pretty much anywhere. After a decent desktop speaker? These versatile Nocs are to be reckoned with.